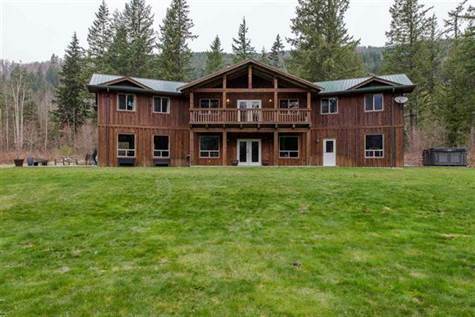 POST & BEAM home situated on 13 rolling picturesque acres in Columbia Valley. Home is 5,730 sq ft featuring 5 bedrooms, 4 full bathrooms, extra large games room, rec room, office, library, flex room, large laundry, spacious living room, open concept kitchen, dining room, eating area, mud room, and storage. Garage is 28 x 28, BAY shop 60 x 30 w/10 door and a carport. Great location and room for B & B or as a family retreat. Close to Cultus Lake and minutes to town for shopping.